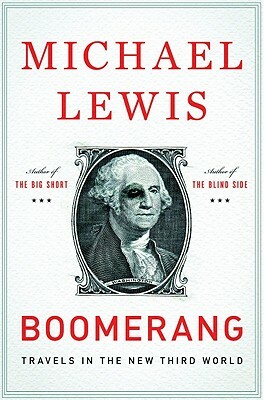 I listened to the audiobook version of Michael Lewis' latest book, Boomerang: Travels in the New Third World. I enjoyed it a lot. In fact, it was so interesting, I've already listened to it twice. Told in the first-person, it's an account of his travels to Europe visiting several countries that have experienced trauma from the financial crisis that began in 2008 here in the US. Lewis has sufficient name cache that he scored interviews with important government officials in several countries. I learned a lot from the book. I learned about some of the different ways the various countries got themselves into trouble. I learned about who the citizens of those countries are blaming for their lot. And I learned a few German swear words. There's a few of them in there. It's not rigorous or complete or comprehensive. In Lewis' style, he drills down into a few interesting alleys in each country. I liked that. If you enjoyed Lewis' book, "The Big Short," then you'll enjoy this book. For a more detailed review, here's the Washington Post writeup on it.